>More details about what led an 11-year-old boy to take his own life in this ESSENCE.com article. Carl Walker-Hoover would have turned 12 tomorrow on the Day of Silence. He didn't identify as gay, and yet he was constantly harassed with anti-LGBT language. It's a tragic reminder of why ALL bullying must stop and why we have to train educators to identify and address anti-LGBT bullying. >Make sure you prepare all of your materials for the Day of Silence tomorrow! > Updated: Find materials for download here. Juggling between homework assignments, extracurricular activities, and organizing a Day of Silence can be a lot! There are so many students who tell me how they spent weeks preparing for the Day of Silence only to be unprepared the morning of their event. From Day of Silence t-shirts being dirty or wrinkled, to speaking cards getting lost, there are a number of ways that your last minute prepping can go awry. Updated: Find materials for download here. In some communities there are people who oppose the Day of Silence (DOS) for various reasons. If you're looking for ways to address critics here is a bit of information. The issue at hand is the bullying, harassment, name-calling and violence that students see and face in our schools. The Day of Silence is an activity created and led by students to educate their peers and bring an end to this harassment. More info can be found on the Day of Silence FAQ page. Those who do not support the Day of Silence often protest, but rarely contribute positively to finding ways to end anti-LGBT harassment. Some individuals and groups organize events in response to the Day of Silence. These folks sometimes misunderstand and frequently mischaracterize the basic purpose of the Day of Silence. Bringing attention to opponents only adds false credibility to their misinformation about the Day of Silence, GLSEN and the thousands of American students taking action on April 17th. If you face hostile students or organizations in your school on the Day of Silence remember to remain calm. GLSEN encourages you to not get into a debate, make gestures and certainly not to get into a physical altercation. If you continue to be harassed, we advise you to contact your GSA advisor or other ally school staff person. GLSEN looks forward to engaging all organizations and individuals who share the Day of Silence vision of schools free from anti-LGBT name-calling, bullying and harassment. 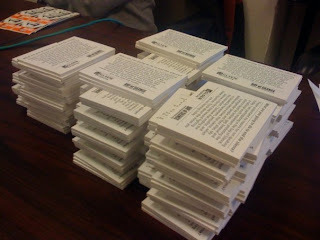 > I wanted to share an activity to do for your Breaking the Silence (BTS) event. Last year I went to GLSEN Kansas City's BTS event. There were a number of activities involved, but one of the most exciting and fascinating of them was the "rush hour rally". I'm not sure if this is what they officially call it, but that is in effect what it was. A group of about 50 students, chapter leaders, parents, and GSA advisers gathered at a public fountain near a busy intersection. 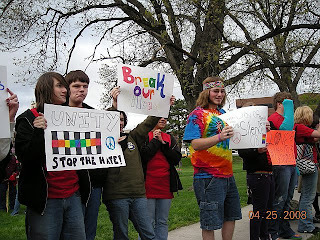 They were decked out in Day of Silence t-shirts and rainbow paraphernalia. They had noisemakers and posters that said "Honk if you support safe schools! ", "Support the Day of Silence! ", "Equality is a right!" and other catchy slogans. They lined the sidewalk and encouraged rush hour motorists to honk in support of the Day of Silence. The air was filled with excitement and camaraderie and every time someone unbeknown to the Day of Silence would honk there would be an overwhelming uproar. They did an amazing job of raising awareness about the DOS to the Kansas city community. It was phenomenal. 4. Invite local performers, singers, musicians, poets, theater troupes, etc. 5. Have food! Have music! Have fun! Looking back on my first Day of Silence, I realize that it was rough. I can remember the negativity that originated from the student body at my high school. I remember the name calling, the threats, and the hate. I remember it being called a "Gay Day", and a lot of the community getting outraged that the school would allow such a thing. Most of all though, I remember the support that came from those who cared. The students and teachers who stood by me throughout the day knew that we were standing up for rights that EVERYONE deserved. Now, a year later, it's amazing to see how far we've come. It leaves me in awe to think about how much our support base has grown. Now I have a established Gay Straight Alliance with a student base of about thirty members... not bad for a school with less than one thousand in total. It gives me great pride to see how far my community has come, all because of a group of people who stood up for what they believed in. So, while you are silent throughout the day on Friday, remember that what YOU are doing is making a difference. You are paving the way for the change that we've all are waiting for. >DAY of Silence? How About a WEEK of Tolerance? >Here's a school that has not only organized a Day of Silence, but has created an entire week of tolerance education! Friday - Day of Silence, where Gay/Straight Alliance students will remain silent and not send text messages during the school day. Students will have permission not to speak from their teachers. All students will be encouraged to wear their Gay/Straight Alliance at Geneva High School T-shirts. "We sold stickers and cards as a fundraiser, and I handed out duct tape to those who wanted to tape their mouths shut and we did get a lot of negative comments. But during the last two periods the club met and there were about 30 people, which was amazing considering our last meeting was only about 15. The day was amazing, and I loved how this day just brought us all together." "My club did DOS Friday April 3rd since we had spring break this week. We didn’t really get a chance to plan much but we made signs and t-shirts. Even though the posters were torn down 10 minutes after being put up almost every time, we kept putting them up and wore SHHH on our shirts. "I just wanted to say THANK YOU for this event. It has changed the judgment from some of my friends and teachers and it was a total blast. It showed me how to handle my temper with people who don't understand the LGBT community; it showed me how to not respond to their negative responses and actions. THANK YOU!" >Tweet the Silence on April 17! >Get Tweet the Silence buttons, click here. Let’s get a Twitter movement going for this year’s Day of Silence. It’s a way everyone can get involve d even if your school isn’t participating in the day of action. Let’s generate some Twitter buzz to support everyone taking a vow of silence. From now until Friday the 17th tweet at least once a day about the Day of Silence. And invite your friends to tweet about it too. And tweet them to become a Day of Silence follower. On the Day of Silence tweet about it as much as possible. Important: If you are a student in middle or high school, make sure you only tweet during times that your school permits. Tweet in the morning before school starts, at lunch (if allowed), and especially after school. If you can’t tweet any other time, plan to tweet within one hour after classes end. We hope that will create a rolling, growing Twitter movement from the East to the West coast as schools close for the day. Students in Alaska and Hawaii, join in when you can. And if you live outside the U.S. you can be a part too. Tweet what you’re doing for DOS. Tweet how many students are participating at your school. Tweet the different ways you’re getting support. Tweet if you’re holding a Breaking the Silence event. Tweet about how many buttons you’re wearing. Tweet about the reactions of your classmates. Basically, if it has to do with DOS, tweet it in the days leading up to Friday. Don’t forget to mention DOS (@dayofsilence) by using the “@” or “#” tags. For general Twitter info, click here. (Now you can use the “@dayofsilence” anywhere in your tweet, not just at the beginning.) More about this tag, click here. April 17th is a Friday, so you can also tag your tweets: #followfriday. That’s a great way to recommend to other Twitter users who to follow. Find out about Follow Friday here and here. We have Tweet the Silence! buttons for your web site. To get one, click here. The Day of Silence is almost here, so get tweeting. >If you’ve been following GLSEN's webpage, or the GLSEN or Day of Silence Twitter, you’ve probably heard about Carl Joseph Walker-Hoover. On Monday, April 6 Carl hung himself in his bedroom with an electrical cord. 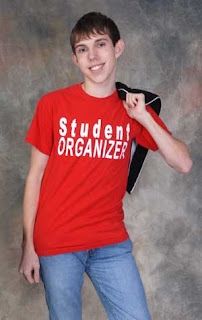 Carl experienced extreme amounts of anti-gay bullying at his school in Springfield, MA. [corrected 4/15] He was only 11 years old. Tragedies such as this serve as an extreme reminder that schools are not safe. That's why it’s as important as ever for all of us stand against anti-LGBT bullying together. On April 17 you will make a strong statement against anti-LGBT bullying in schools. By participating in the Day of Silence you will represent all students who have felt silenced by the bullying and harassment they experience in schools every day. Most importantly, you will be taking a step towards making your school and all schools safer. And, as we have been so sadly reminded, that’s exactly what we need right now. Thank you for all the amazing work you do to make schools safe for all students, and keep the ideas coming on how you can have an amazing and impactful Day of Silence! What are you going to do to end the silence? >GLSEN's Executive Director Eliza Byard has spoken with the family of Carl Joseph Walker-Hoover, the 11-year-old boy who took his own life Monday after enduring constant bullying, including daily anti-gay language, at school. Carl did not identify as gay. Read GLSEN's initial press release about the bullying and suicide here. I want you to know that I have been in contact with the Walker family regarding the suicide of 11-year-old Carl Walker-Hoover this past Monday. I have extended sincere condolences to the family on behalf of the entire GLSEN network, explained our mission to end bullying and harassment of all students, regardless of sexual orientation and gender expression, and asked for – and received – Carl’s mother’s permission to talk about Carl’s story in the context of the Day of Silence next week. The Day of Silence will fall on what would have been Carl’s 12th birthday. On the most recent call, a family member said, “Even though this event is on Carl’s birthday, we believe it is important that his story be told. Whether or not a student is gay this language should not be used to insult others.” I have expressed to the family GLSEN’s collective resolve to do all in our power to heed his mother’s call to action and ensure that in the future no more students suffer as Carl did.